Extended until 6/30/2019 (subject to change by Dymo). This exclusive promotion is very simple. All you need to do is buy a minimum of 20x "eligible" Dymo Labels from Labelcity (see below for definition of "eligible") and you can claim a free Dymo LabelWriter 4XL Printer by mail-in redemption from Dymo. NOTE: YOU DON'T HAVE TO BUY 20 OF THE SAME LABELS, BUT YOU MUST BUY 20 THAT ARE 'ELIGIBLE' TO TAKE ADVANTAGE OF THIS PROMOTION. What are "eligible" labels ? All Dymo LabelWriter Labels (click here) except items #'s: 120260R, 120339, 120400R, 120500R, 120886, 121000, 121000R. Remember, you don't have to buy 20 of the same label. You can buy any combination of eligible labels. 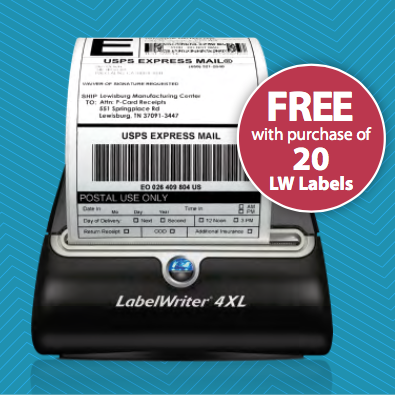 Tip: to make it easier to know if a label is an 'eligible label', just look for the text that reads Buy 20 and redeem a FREE Dymo 4XL and you're guaranteed that label qualifies. What is the Dymo LabelWriter 4XL Label Printer? How do I get my free Dymo 4XL label printer? After receiving your label order from us, simply complete the Rebate form (link below), send it in to Dymo and they will send your free printer. Offer is valid in the U.S. only. Offer is valid for U.S. citizens only. See Rebate form for full T&C's. If you lose your Invoice/Receipt from Labelcity, just call or email us with your order number and we can email you a fresh copy. If you have any questions about these promo's, please call or email us and we'll guide you through the process of redeeming your Dymo printer. Note : the terms and conditions of this promotion are set by Dymo. See rebate form for full details.